Earlier this year I had the privilege of speaking to a group of women from my church about what it means to be a Christian. Spoiler alert! It is NOT about believing. 1 One day as Jesus was preaching on the shore of the Sea of Galilee, great crowds pressed in on him to listen to the word of God. 2 He noticed two empty boats at the water’s edge, for the fishermen had left them and were washing their nets. 3 Stepping into one of the boats, Jesus asked Simon, its owner, to push it out into the water. So he sat in the boat and taught the crowds from there. 4 When he had finished speaking, he said to Simon, “Now go out where it is deeper, and let down your nets to catch some fish.” 5 “Master,” Simon replied, “we worked hard all last night and didn’t catch a thing. But if you say so, I’ll let the nets down again.” 6 And this time their nets were so full of fish they began to tear! 7 A shout for help brought their partners in the other boat, and soon both boats were filled with fish and on the verge of sinking. 8 When Simon Peter realized what had happened, he fell to his knees before Jesus and said, “Oh, Lord, please leave me—I’m too much of a sinner to be around you.” 9 For he was awestruck by the number of fish they had caught, as were the others with him. 10 His partners, James and John, the sons of Zebedee, were also amazed. Jesus replied to Simon, “Don’t be afraid! From now on you’ll be fishing for people!” 11 And as soon as they landed, they left everything and followed Jesus. It was like any other day. Two brothers, Simon and Andrew, woke up very early, splashed a little water on their face, ate a little bread, put on their sandals and headed to the Sea of Galilee to work a long day. It was their livelihood. Their families depended on them. Then three words spoken by a traveling rabbi changed their lives forever. This was the beginning of life with Jesus for these two brothers. Where did your journey with Jesus begin? Can you think back to a specific moment where you would say it all started? For some of us, we have a story like Paul where we were blinded while walking on a road headed in the wrong direction. Everything changed in a single moment. A great awakening. For others, maybe it was something gradual that happened over time as you attended church with your family. A still small voice whispering inside of you for years. Whatever it was for you, wherever you trace the beginning of your life with Jesus, remember this: He called you. Life with Jesus starts with a call. Jesus has called you to his side. Come, follow me. Notice that when Jesus called Simon and Andrew to be his disciples, it was an invitation to FOLLOW not just to believe. What is a disciple, after all? A follower or student of a teacher. Sometimes being a Christian can be watered down to a single prayer, a single moment in time. A prayer to God for forgiveness whispered long ago. To be a Christian is to be a Christ-follower. To be a Christian is to be a disciple. So, Life with Jesus starts with a call. But, that is just the beginning. Then what? What did Simon and Andrew do after they were called? They were called. Then the immediate next step was to drop everything and follow after Jesus wherever he went. Notice the order of events here. Before they could follow after Jesus, they had to stop whatever it is they were doing. Simon and Andrew had to drop their nets and leave them behind. They had to let go of what was in their hands in order to follow after Jesus. Is there something I haven’t let go of in my life that is preventing me from following closely after Jesus? I know I am a believer, but am I a disciple? One who follows closely after Jesus? Is there something I am holding on to that is holding me back? Letting go is hard. And it isn’t a one-time thing. It is every day and throughout the day where our time and attention is drawn to many other things; often good things, but other things. If any of those things stand in the way of following after Jesus, they are idols. And we all know how God feels about idols. Life with Jesus requires a commitment. A striving to empty our hands of anything that prevents us from following after Jesus. We are called, but salvation is not the calling. It is just the beginning. We pray for the forgiveness of sins. We confess with our mouths that Jesus Christ is Lord; we believe. That makes us believers, but even the devil believes in God. We are called to be more. We are called to be disciples of Christ; to follow after him. In the time of Jesus, rabbis had disciples who followed after them. This was a profession in Jewish culture for those who might become religious teachers. 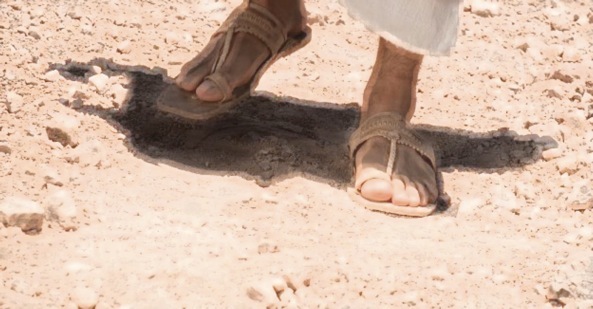 In fact, I’ve heard it explained that to be a disciple in those days was to be covered in the dust of your rabbi because you were following behind him so closely on the road- you couldn’t help but get dusty. We are called to follow after Jesus in this way. Not a few miles back, at a safe distance where we can catch up whenever it is convenient, but we are called to follow so closely that we are covered by his dust. Life with Jesus requires a commitment; a saying “yes” to whatever God asks of us. So, let’s imagine ourselves in Simon and Andrew’s shoes. We were called by Jesus. We dropped everything to follow closely after him. Now, what does that look like? Where is Jesus headed? Wherever He’s going, he’s not going alone. Right? He’s called us. We’re looking around though, wondering where we’re going. Wondering when we can stop for food and take a break. But, Jesus, our teacher, has a lesson for us. 8 When Simon Peter realized what had happened, he fell to his knees before Jesus and said, “Oh, Lord, please leave me—I’m too much of a sinner to be around you.” 9 For he was awestruck by the number of fish they had caught, as were the others with him. 10 His partners, James and John, the sons of Zebedee, were also amazed. Are we ever guilty of doubting God like Simon did? Maybe it isn’t that obvious. Maybe we just don’t expect God to do something. I think very often, we just don’t expect God to show up. Or maybe it’s not always something we want God to do. Maybe it’s something we think God wants us to do. A habit you need to break. A person you need to forgive. Maybe you need to say “I’m sorry” to someone. Maybe you’re afraid to pray because you are worried what God might want you to do if you really follow him wherever he goes. Has God ever surprised you by showing up where you didn’t expect? Maybe in a phone call or email that comes out of nowhere. Maybe in the kindness of a stranger. Maybe in your own life when you’ve overcome something you never thought you could. Do you live in expectation of God working? Do you wake up expecting something important to happen that day because you are following after Jesus? I think this is the first lesson the Rabbi Jesus taught his first disciples. EXPECT GOD TO SHOW UP. So, what else did Simon and Andrew learn from this first encounter with Jesus? The boat is sinking for so many fish have come in. Everyone is amazed. What happens next? JESUS WANTED COMMUNITY. He called disciples. Not just to forgive their sins. Not just so they would believe in him. But TO LIVE WITH HIM. To go with him wherever he goes. Together. Jesus lived in community with his disciples and then they went out and served together. We see it throughout the Gospels. Jesus surrounded himself with a community. And now we are part of the community of Jesus today. And, what should this community be about? We’ve been called. We are following Jesus. We are traveling together. Where are we going? What are we doing? Life with Jesus was ALL about people. He called disciples. And what was their first assignment in life with Jesus? Fishing for people. And he told them not to be afraid at his power. Come, follow me. And expect great things. I imagine following after Christ looks a lot like a convergence of people from all over meeting up to follow the same Rabbi down a dusty road. And it just keeps getting bigger and bigger. Life with Jesus happens in community. One of my favorite passages in Scripture talks about one of the first church communities. This was after Jesus’ death and resurrection and the disciples we’re continuing his ministry. They were going to the people like Jesus did and telling the people all about Jesus and what he taught them. And they were inviting people to be disciples of Jesus too. Because what could be more exciting to a group of Jesus’ disciples than talking about Jesus and inviting others to this same opportunity? In the book of Acts, we read more about this first group of disciples and how they lived in community with one another. Note the different activities that defined this group of disciples. So, what actions defined this first community of disciples? How did they follow after Jesus TOGETHER? 1) They devoted themselves to the teachings of Jesus. Back then they had memories of him. They had physically walked with him. And they wrote down those memories of his actions and teachings. And we have access to those teachings today through the Bible. But, let us not just focus on the words in the Bible; let us instead meditate on the actions of Jesus. 2) They spent time in fellowship with one another. Sharing of meals, enjoying each other’s company, etc. Fellowship is a church word, but it just means spending time together, hanging out. We need community. 3) They worshiped. Prayer, praising God, telling others about Jesus, etc. These are all acts of worship. 4) They helped those in need. People in need don’t always come to you. Sometimes you have to go to them. It’s hard to ask for help. Many people won’t. They suffer in silence. Jesus went out to the people. He went where the need was. He didn’t walk in the other direction. And He didn’t sit down and wait for people to come to Him. And neither should we. Disciples of Jesus should be moving in the world not just sitting in churches on Sunday morning expecting a hurting world to come to us. So here we are, disciples, followers of Jesus. We need to let go of whatever we are holding in our hands. We need to be headed in the same direction as Jesus. Together. Not only headed in that direction, but so close to Jesus that we are covered in his dust.